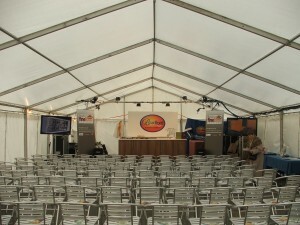 Marquee Hire | What is a Clear Span Marquee? I met with a potential customer the other day who are getting married at one of our partner venues, who had suggested they needed a marquee for their evening celebrations as the venue was not big enough to cope with the extra guests in the evening. It was a question which inspired me to write this post as a simple introduction to clear span marquees. Clear span is a term often used in construction and property to describe an open area with no obstructions. For example, a warehouse. How does this relate to a marquee? Clear span marquees don’t have any interior support poles, such as you get in a circus tent, traditional pole marquee or kata tent to interfere with sight lines, and get in the way of dance floors, stages, tables, equipment and anything else that is placed inside the marquee. Large, aluminium box beams support the whole of the clear span marquee structure and are then covered with heavy duty and long lasting flexible PVC fabric for walls and roofs which are tensioned to the aluminium structural frame. The frame is then attached in many cases to an aluminium sub frame floor sytem with wooden panels, which can be carpeted if required. The interior of the marquee can be lined out with a wide range of different roof and wall lining choices or left unlined for industrial use. A multitude of lighting and heating/cooling systems can be installed before lining out. The individual solid PVC walls can be replaced with glass windows, clear PVC or Georgian window walls. Walkways, pagodas and entrance porches can be easily attached to the main structure. A clear span marquee is an incredibly versatile temporary building and can be installed for months or even years with very little in the way of maintenance and can be used for many different types of purpose including wedding marquees, corporate events, temporary warehouse space, conferences and exhibitions. Clear span marquees can be staked or weighted to the ground and therefore don’t require the use of ropes or guy-lines as you would see on a typical circus style tent. Also, most clear span marquee structures are designed to withstand severe weather and meet all national building and fire codes. For technical data and more information about clear span marquees take a look at Custom Covers who manufacture our marquees.